And now comes Blog This for RSS Bandit. RSS Bandit is a popular feed reader (what are feeds?) which by default can Blog This with w.bloggar (a desktop blogging client) and post to del.icio.us. Installation is simple albeit manual. Extract the file, highlight the files, then copy and paste them into the RSS Bandit plugins folder: not into the Windows Live Writer plugin folder. Start RSS Bandit. See something you would like to write about? 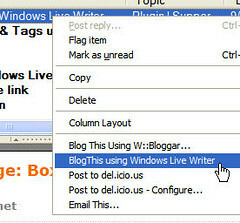 Right-click on the headline and choose BlogThis using Windows Live Writer. I just wrote about wanting to write this plugin a few hours ago. I'll probably still write one on my own and replace the w.bloggar plugin in the default install of RSS Bandit with a Windows Live Writer plugin. Perhaps even an installer for existing users who don't want to wait until the next version of RSS Bandit to get this feature?